First Market a Hit! More Next Thursday 4-8pm! The pipers, smiles, farmers and dancers say it all! It was a great day for the Mission. 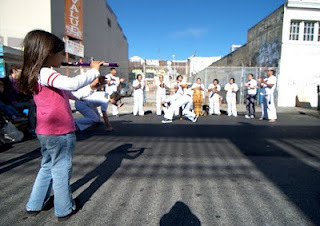 A street was turned into a symbol of what makes the Mission Community: A play street hosted by the Mission Beacon and Dolores Community Youth Alliance, YMCA Mission Girls youth painting a mural panel with Root Division artist Chris Treggiari, a space purifying ritual from Danza Azteca, the unbelievable Abada Capeoira, and Mission musicians Classical Revolution, Dave Mihaly, and Seth Augustus from Porto Franco. There were local crafts from MiSBA and the Women’s Initiative. And what’s more? Delicious foods. Amazing, fresh summer produce! Dry farm tomatoes from Blue House, fresh Sunny Farms basil, sold-out blueberries from Rainbow Orchards, sweet Tomatero strawberries, and sumptuous peaches from Twin Girls. Topped off with La Cocina snacks, the Mission Market’s Antojitos Salvadorenos pupusas, and Sweet Constructions‘ desert. Great to have the Mission out in the street! See you next Thursday, 4-8pm. 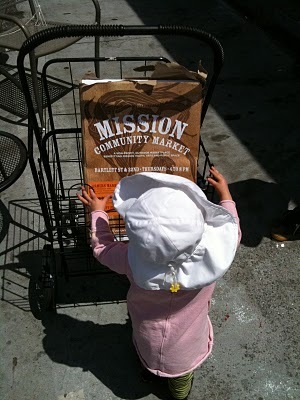 Thanks to the Mission Community for supporting the Mission Community Market on June 19th, to our sponsors, and to our partners. 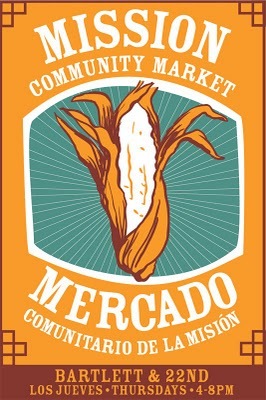 July 22 – 4pm-8pm – Bartlett @ 22nd – The Mission Community Market begins and will only grow from here. Collaborative youth mural project led by Chris Treggiari of Root Division Arts Collective. Youth from YMCA Mission Girls and the Mission Beacon will be in attendance. All are invited. Strolling thru Sunday Streets. Thank you Boogaloos! Great to see you all again strolling down Sunday Streets to the Mission Community Market table! Thank you to Boogaloos for their sponsorship, cake, and coffee and to our wonderful volunteers Leah, Marlon, Becky! 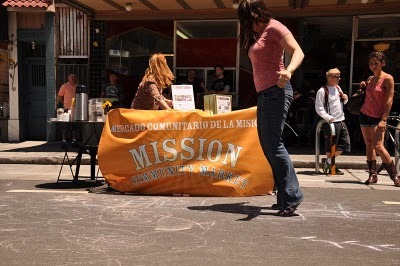 We had a great day getting the word out about the new Mission Community Market on Bartlett. See you at the first Market, July 22nd! Gearing up for the first market – JULY 22nd!!!! Get ready for the first market – Thursday JULY 22nd!!!! 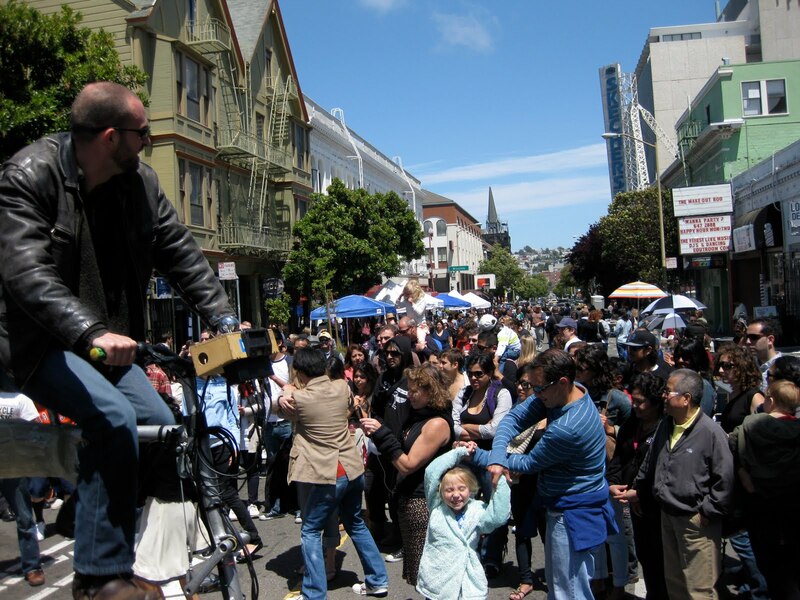 Hop, skip or jump down to MCM table at Boogaloos (Valencia and 22nd streets) during Sunday Streets to learn more! Sunday July 11th from 10am-3pm! Boogaloos coffee and cake sales go to MCM. Great article by Alejandra Cuellar in El Tecolote.